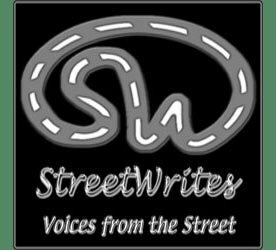 I am going to post here a series of poems I wrote while I was homeless; and, I hope, other members of StreetWrites will either post theirs, or allow me to post them. A poem is whatever I, as a writer, persuade you, as a reader, to experience as a poem. Some readers are convinced all of the time: they will gush equally over Jack Kerouac and every imitator at the neighborhood open mic, as well as Rod McKuen, Hallmark cards, and at least some advertising copy. Some poetry convinces almost everybody: The Twenty-Third Psalm; Dylan Thomas's "Do Not Go Gentle Into That Good Night"; Eugene Field's "The Duel"; some of the classic haiku, don't yell at me if I forgot your favorite just plug it in here yourself. Some people will never be convinced by any work unless it is iambic pentameter and rhymes; or it contains a seasonal word; or it refers only to emotion and subjective experience; or it refers only to external, objective experience; or an infinite range of other specific criteria. There is more than one kind of poet in the world because there is more than one kind of reader in the world. Myself, I am in favor of craftsmanship and working on a poem -- not just spilling my guts on a page and calling it good. But I don't think any of the technical criteria in the world will save you if you haven't got any guts in there at all. There has to be some heart, soul, insight, or feeling to spark a poem, to make it worth writing and worth reading -- and that is the essence of what reaches up and grabs a reader, what makes someone say, "That's a poem." I am content if at least some of the readers in the world respond to me. If twenty people tell me "I can't make head or tails of this", I'll sweat over a re-write. If ten people cry because they did understand me, and ten others are still scratching their heads -- then I know the audience that I speak to.